Happy Labor Day Team Stryker fans! I decided to post a new page today even though it’s a holiday since the issue had just started up and didn’t want to take a break. 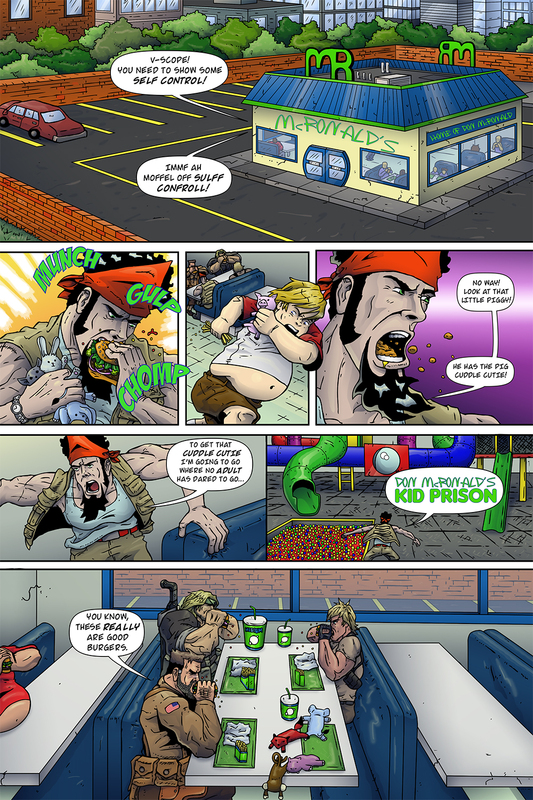 In today’s page we get our first glimpse into a McRonald’s restaurant which was very daunting as exterior two point perspective shots are always the bane of my existence. As I’ve mentioned before, I’ll never try to avoid them because they’re so important, but it’s always a struggle to get them right. I wish I could make a comic that had no backgrounds and just had characters fighting each other on every panel. It’s always these less action-y pages that prove to be 100x more difficult. Trying to draw three people sitting at a table takes WAY longer than three people fighting. The goal is to make the panels feel just as interesting even if nothing special is happening. Have a great Labor Day and don’t forget to follow Team Stryker on Facebook, Twitter and Patreon.